While I remain convinced that Microsoft’s Nokia acquisition was largely driven by fear of losing Nokia as an OEM, either to Android or bankruptcy, there is something else curious about the timing. ValueAct, who is opposed to Microsoft’s push into devices, was dissuaded from a proxy fight last Friday (the last day to file their intentions). The price? Steve Ballmer as CEO. However, they don’t join the board for another month. And so, Ballmer and the board, fully committed to becoming a devices company, pushed through the Nokia acquisition (ValueAct had no idea), locking in the devices and services strategy (and the reorg to a functional organization). Shades of the old Microsoft, to say the least. In this version of the story, Stephen Elop is almost certainly the next CEO; this telling presumes that the Nokia discussions proceeded in tandem with the reorg, with the presumption Elop would take over a functional organization in 2018, Ballmer’s original retirement date. Now that will be pulled forward. That’s the tell, in fact. Will Elop be CEO? If my original theory is true – that Nokia was on the verge of leaving Windows Phone, either for Android or bankruptcy – then Elop simply can’t be a serious candidate. The tragedy in the deal, as I hinted at earlier, is that I think Microsoft ought to abandon Windows Phone. The war is over, and iOS and Android won. It would be far better for Microsoft to focus on serving and co-opting those devices, instead of shooting the most promising parts of their business in the foot for the sake of a platform that is never going to make it. 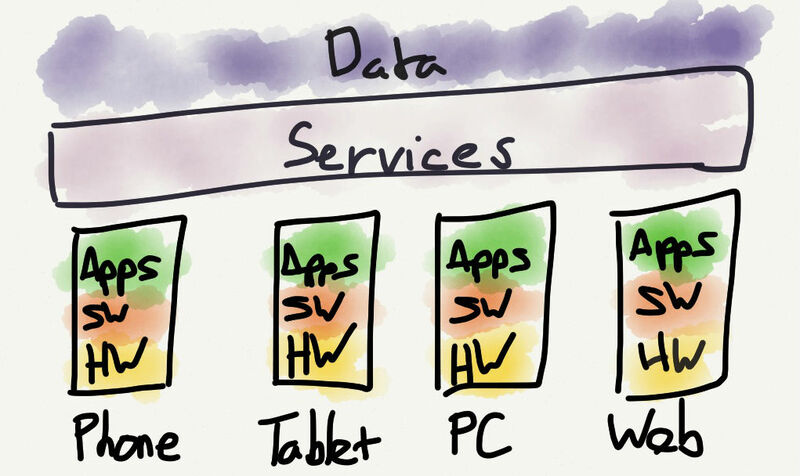 The issue for Microsoft is that a services strategy and a devices strategy are fundamentally opposed to each other. Your services will be forever paying a strategy tax to support your devices, which won’t even be fully differentiated. You see this happening right now with Office. Microsoft has to date refused to release Office for iPad, presumably to help make Windows 8 a tablet success. On the flip side, there is finally a version of Office for iPhone and Android, which removes a key Windows Phone differentiation. It’s a mess. If you believe that strategy is about making choices, then it’s clear that “Devices and Services” isn’t a strategy at all. Yet, it now seems highly likely that this “strategy” will be put into effect, which in practical terms will mean the continued hamstringing of Microsoft’s services to support their push into devices, magnified by the “One Microsoft” reorganization. Microsoft has some great services up-and-down the stack, and Office 365 in particular is remarkably innovative from a business model standpoint, and a much better product than critics like to admit. Microsoft ought to have their entire weight behind protecting their business turf and winning in the cloud and premium consumer services. As someone who wants to see Microsoft succeed (or at least not fail), for the sake of my many friends who work there and the Seattle area as much as anything else, it’s disappointing. Alas, it’s not surprising.